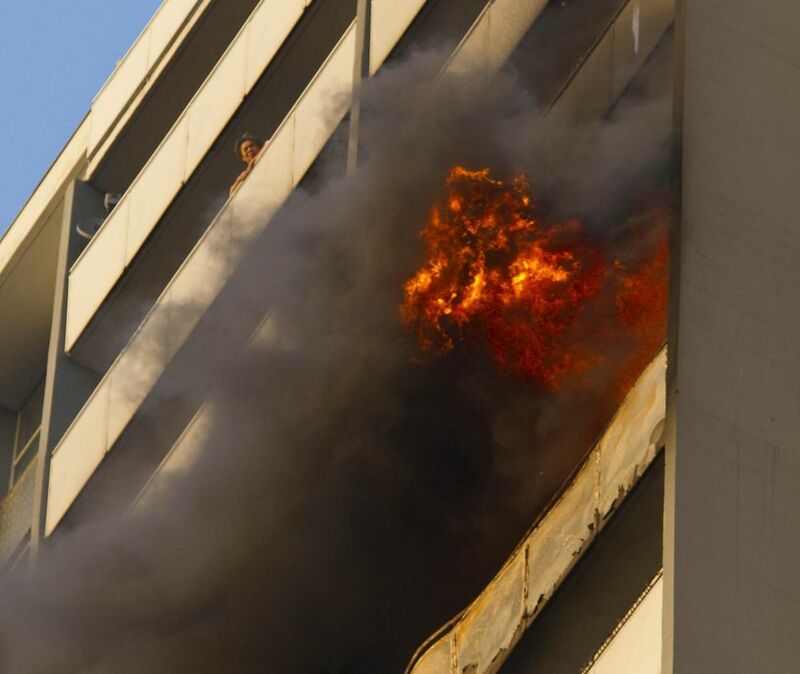 Hundreds of people forced out of their apartments in downtown Toronto after a terrible fire. Forced to stay in hotels or makeshift shelters, and not sure when they’ll see their homes again. That was the story in 2010 when a fire broke out on the 24th floor of a TCHC building at 200 Wellesley St. East, displacing 1,700 residents. It was an emergency the city was supposed to learn from so that they could do better next time, with the implementation of 15 recommendations from the city ombudsman. But eight years later, Toronto faces a similar crisis as a six-alarm fire at 650 Parliament St. has forced the displacement of 1,500 people, and created some of the same frustrations, even though city officials say the recommendations have been implemented. On Friday, residents of 650 Parliament St. rallied with anti-poverty group ACORN to demand answers from the property manager on when they can return to their units. Ashkan Ansari, who’s currently staying with friends, after being forced from his bachelor apartment there, said the situation is chaotic and frustrating, and wants the city to do more to help. “People are so suffering,” said Ansari, a member of ACORN. The ombudsman’s investigation into the Wellesley St. fire, launched after receiving complaints from residents there about the city’s response, found “significant confusion in the days and weeks following the fire” due to “a lack of communication at all levels,” her report noted. Many staff didn’t have the right training, hotel assignments were not handed out efficiently, residents complained about the choice of food vouchers and that they didn’t provide access to food that met dietary requirements. The city didn’t follow its own protocol not to accept in-kind donations and this took a lot of time and resources away from emergency management, and there was no clear protocol for dealing with vulnerable populations. Then-ombudsman Fiona Crean made 15 recommendations, all of which the city agreed to implement by June 2013. City spokesperson Tammy Robbinson said last week that all of the ombudsman’s recommendations have since been addressed. “Most significantly the city has established a Memorandum of Understanding with the Canadian Red Cross for the streamlining of services at our emergency reception centres and the assessment of evacuees registering with them for services,” she wrote in an email. As well, all city staff responding to any emergency involving evacuees have received training through the Office of Emergency Management, Robbinson said. Financial donations are being funnelled through the Red Cross, while Community Matters Toronto and James Town Community Corner are dealing with clothing. The 2012 Vulnerable Populations Protocol “has evolved” as Emergency Social Services policies and procedures were updated after being integrated into the Office of Emergency Management, Robbinson said. Vulnerable people are assessed at the emergency site. “In this particular emergency every effort has been made to ensure vulnerable evacuees were assessed at a number of different touch points (registration, intake at a reception centre, hotel etc.) in order to identify individual need,” she wrote in an email. “Communication during any emergency is a challenge for all involved. The City of Toronto has done its best to communicate through social media, website, news releases and via 311 but as people are widely dispersed during an evacuation such as the one at 650 Parliament it is extremely difficult to reach everyone affected,” she added.an services. The chain of command and communications were also supposed to be improved. Only about 700 of the more than 1,500 forced out of the building by the fire were put in hotels and they now have to be out by Tuesday at the latest, heading to an emergency shelter at the Regent Park Community Centre. The building manager, Doug Sartell, told reporters Friday that he hopes to get residents back home by Thanksgiving. Ansari said residents were given TTC passes from the city for September but not August, despite the fact that they’re racking up commuting costs coming into work from places from all corners of the GTA where they’re temporarily staying. They were also given a $50 voucher for Walmart every week, which he said isn’t enough. Asked about the gift cards, Robbinson said residents only receive tokens based on their individual need. The city says hotels are full as it’s a busy season, and advised residents to find other accommodation, with friends or family. “Following the evacuation from 650 Parliament, every effort to secure hotel rooms was made as quickly as possible. A citywide search was required to identify any rooms that were available and evacuees were placed as they were identified and secured,” Robbinson added. But Ansari said people need more privacy than sleeping in the shelter will give them. “Unbelievable, it’s happening in Toronto, and it’s happening in the heart of Toronto, that’s unbelievable,” he said.